Let’s face it, disagreements, disputes, accidents, and altercations happen due to a wide variety of circumstances; and, when they do, all parties involved need professional, reputable industry experts to review the matter and assist by providing industry experience, insight, guidance, opinions, testimony, and reports that will aid in solving, resolving, or settling the matter efficiently and effectively. 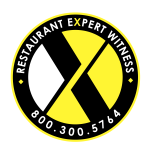 Restaurant Expert Witness – Howard Cannon will provide a written report (although, sometimes an oral opinion is required) which includes opinions about the matter which he examined and analyzed. This expert opinion will be written in a clear, confident and supportable manner – stating the opinion(s) and the reasoning behind it. In addition, the expert report will contain all documentation and information considered in the process of forming such opinion(s); including a list of all exhibits, photographs, diagrams, publications, and resources used to support it. All documents reviewed in consideration of the matter will be cited, regardless as to whether or not they are relied upon in the process of preparing his expert report. Mr. Cannon’s expert witness report will also contain a listing of publications he authored.